This weekend, I worked on taking down my family’s Christmas trees. I only got some of the work done! At first, I didn’t want to take them down – I love how pretty they are – and then everyone in my family got sick! We are still recuperating. 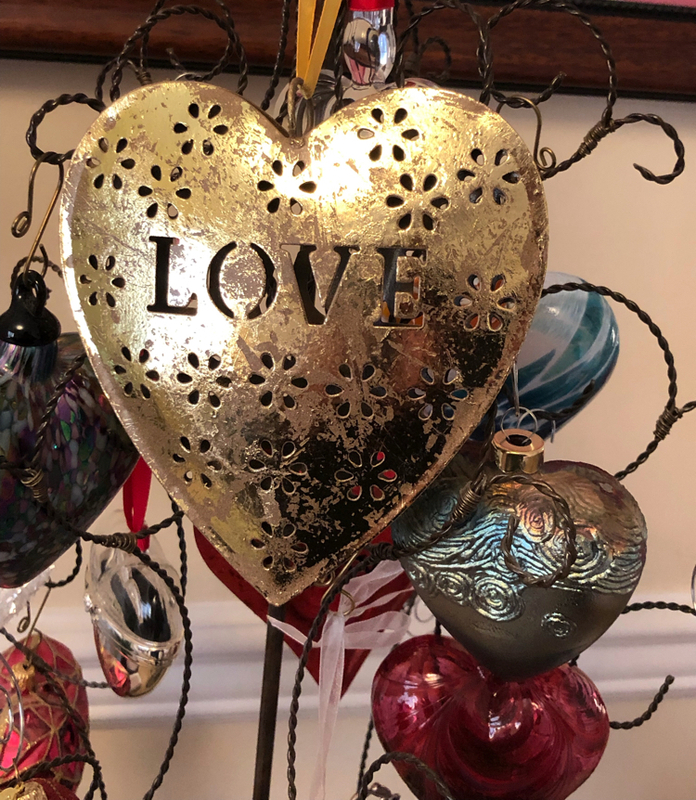 Among my family’s many Christmas ornaments are some beautiful heart ornaments that my husband has given to me. Every Christmas my husband gives me at least 1 new heart Christmas ornament. 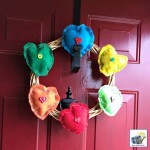 This year, my husband gave me a whole box of heart ornaments! I wanted to enjoy my heart ornaments a little longer. 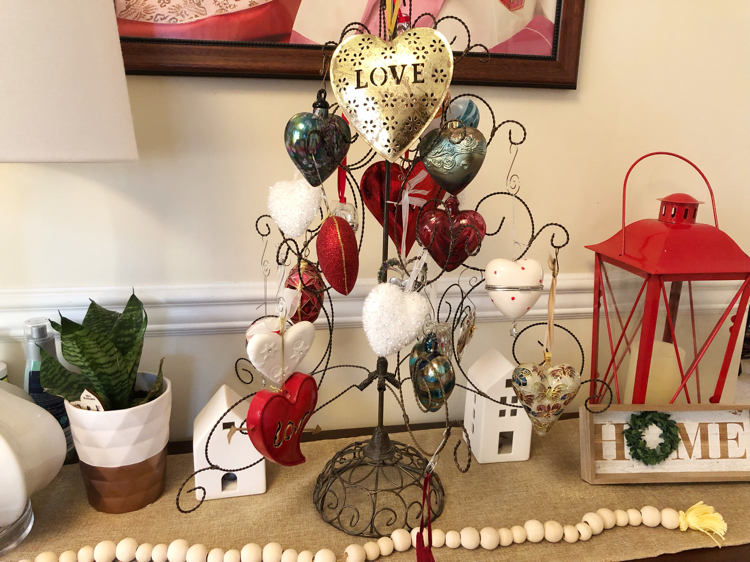 So I set up an ornament tree my husband gave to me a few years ago and hung some of my favorite heart ornaments! Among the ornaments I hung is a big gold heart ornament with the word “love” on it that he gave me this year. I placed a gold burlap table runner underneath the ornament tree to protect the table. My husband was smart to create our heart ornament tradition. 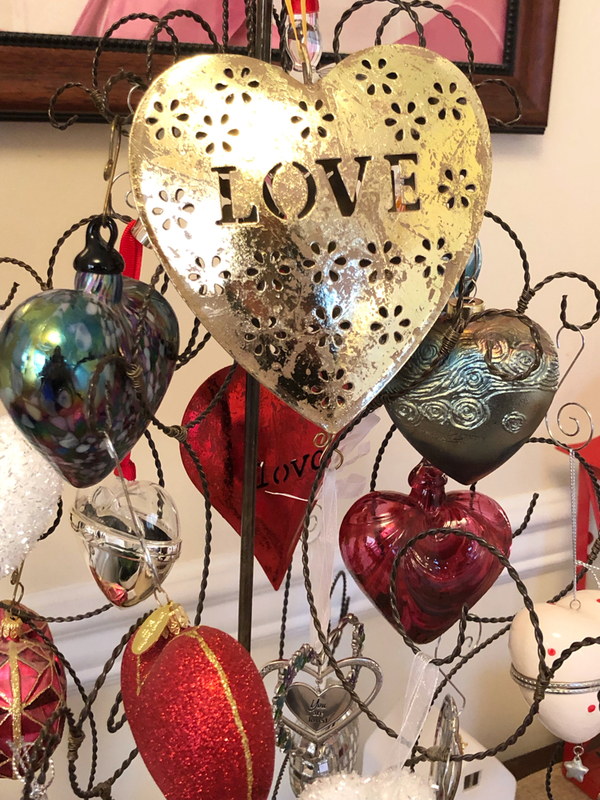 The heart ornaments are pretty, sweet, sentimental, and can double as Valentine’s Day decorations! I put the ornament tree on my living room’s console table, one of my favorite spots to decorate in our home. (The table was an unfinished Shaker table from Amazon that I painted and stained myself.) Now I can see the heart ornaments whenever I enter our home. 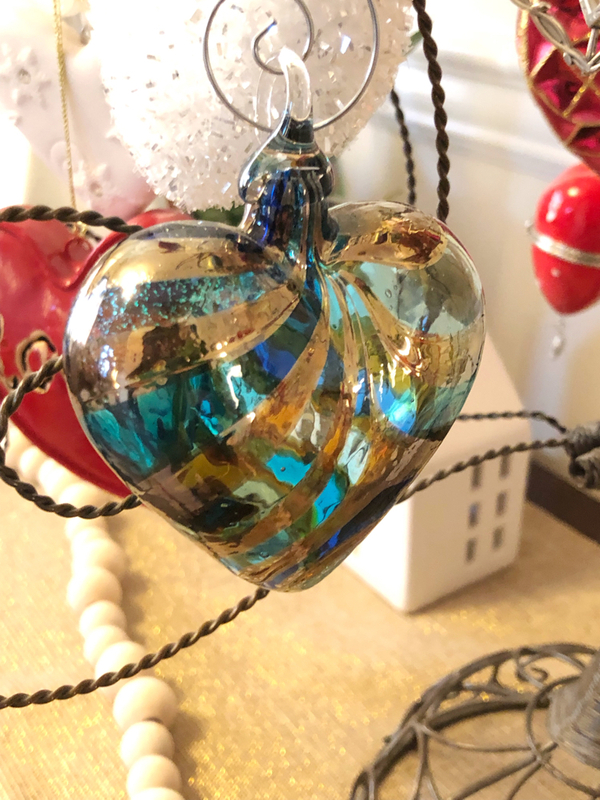 Many of the ornaments on the ornament tree are glass heart ornaments — I love glass art, so my husband has given me several glass heart ornaments! 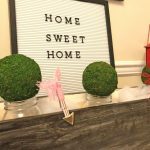 Also on my Valentine’s Day walnut console table is a sweet home sign and handmade wood bead garland that my friend, Carrie of Curly Crafty Mom, has gifted me — the “home” sign was for my birthday last week. The cute ceramic white houses are from the Christmas village that my daughters had created on our console table this year. I also added a pretty red lantern . 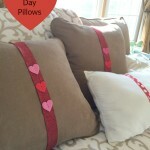 I am looking forward to doing some more decorating for Valentine’s Day — it’s one of my favorite holidays! 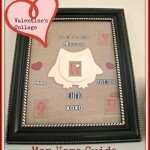 I still have some preparations to do for Valentine’s Day — the holiday is only about three weeks away! How do you celebrate Valentine’s Day with your family? Please share in the comments! 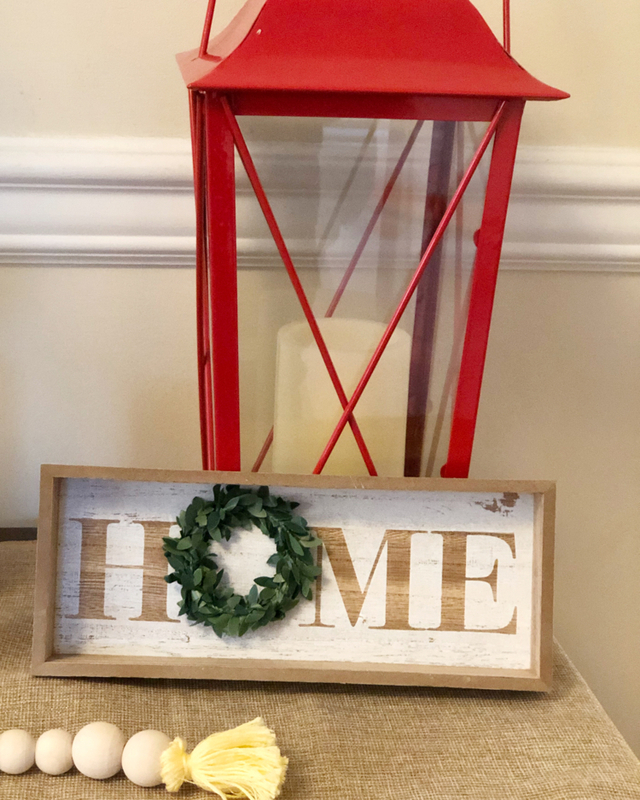 This post was shared at the Homestyle Gathering link party. That tree is so sweet, and very inspirational! Love! 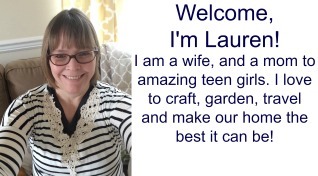 So glad you shared at Homestyle Gathering, sweet Lauren! 😉 Thank you for joining us! Thanks for hosting, Julie! ?? I love your heart ornament tree! I’m glad I decorated for V-Day this year, I am really enjoying my decor! Some years I don’t decorate, though. 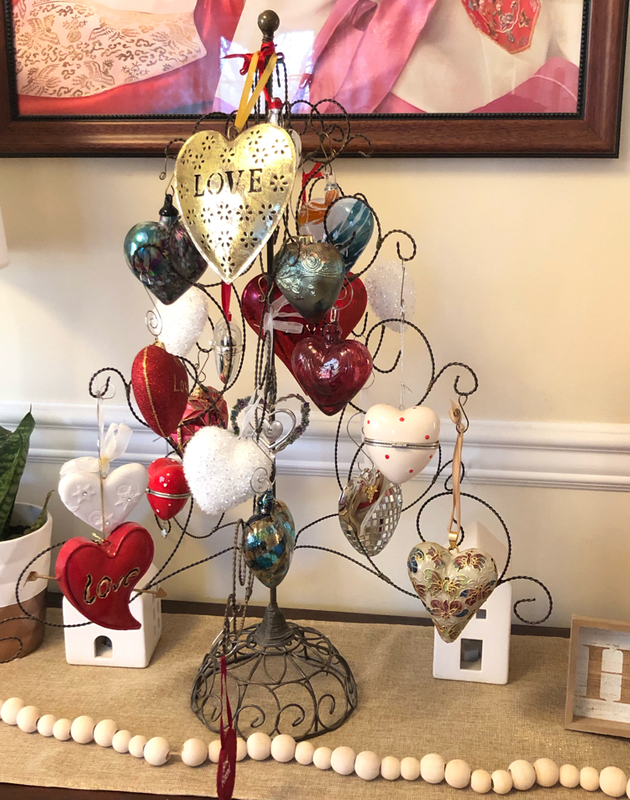 I love your heart ornament tree! They def. are perfect to display in January and February! That is such a sweet tradition. Such a sweet glass ornament display, Lauren! I have never done a Valentine’s tree, but I’m in love with the idea. We haven’t really celebrated in a big way in the past, but I’m getting more into it now! 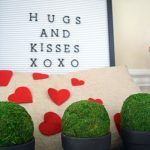 Love your fun Valentine decorations! 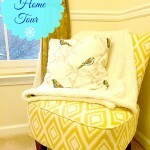 You are inspiring me to get my home decorated!